Abracadabra is the magic word, but does that apply to wizarding 5 reels? Who knows? Lucky Spell at Wizard is definitely worth a spin. 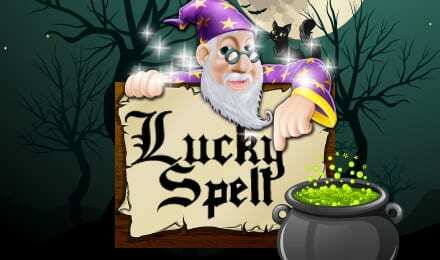 Join Merlin to find the missing ingredient to win yourself a huge jackpot in this exciting online slots casino. Founded in 1997 as a computer game company, Eyecon has been creating online slot games and online scratch card games for well over a decade. After releasing their very first slot game: Temple of Isis in 2003, the company has gone on to create some of the most memorable online gaming experiences across the globe with no sign of slowing down. As you can probably guess by the title of this game, this a magic based game. Ooooo magic, not exactly on the same lines as Houdini, think more The Sword in the Stone wizard with the pointy hat and eccentric behaviour. This online slot has the personality we’ll give it that, but it also has the benefit of being quite the addictive slot which in a way is magic within itself. Created by Eyecon Lucky Spell is equal parts innovation and dedication. Not any game developer can toe the line between the two quite like Eyecon. So get ready to open your spell book and cast your wand because it is time for a magical thrill ride like no other slot games can bring! Play UKs best slots like this one today. Lucky Spell takes place within a wizard's lair (let's call the wizard Merlin). The game screen itself features a reel set/pay-table on permanent display on the right-hand side. Merlin can be seen dressed in purple holding a magic wand on the side of the game board, it’s almost like he is watching you not mess up your spells. The room is seemingly at the top of medieval-like a tower, very fancy and very posh for a wizard who is probably on 30k a year give or take. 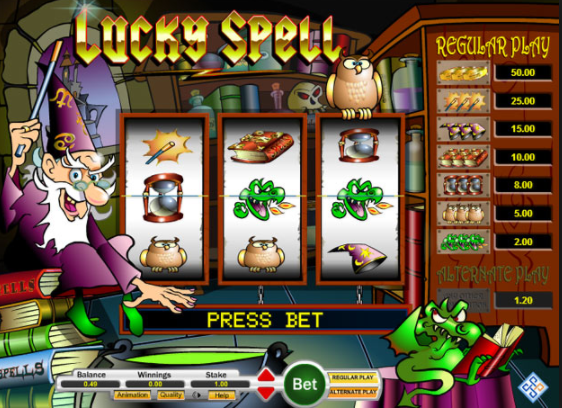 Lucky Spell might not blow your socks off and put them back on again but it does a great job of conveying a coherent theme throughout. Magic is such an overplayed theme for these types of games we know, but we also know that Lucky Spell is worth seeking out and playing because of just how darn fun it is. 3 reels and a single pay-line are the game's bread and butter, creating a horizontal game board that is visually quite different from your more kosher slot. The goal is simple: match 3 or more symbols on the reels to win cash prizes. Even the simplest of muggles could work this out. Another great game to try is our 1can 2can slot.